There are so many reasons why you need to take a trip to Yosemite National Park. This attraction features all kinds of amazing things to see, like the Mariposa Grove of Giant Sequoias. You will love this particular feature of Yosemite National Park, so start making your travel plans today! The Mariposa Grove of Giant Sequoias is famous for being the largest sequoia grove in Yosemite. You’ll be blown away by these tall, tall trees that make up this beautiful forest. This grove contains the extraordinary Grizzly Giant, which is 1800 years old and is almost 30 feet in diameter at its base! The Mariposa Grove of Giant Sequoias also contains the iconic California Tunnel Tree, which is a living sequoia with a hole drilled through it so you can walk underneath this massive tree. Now that you know what the Mariposa Grove of Giant Sequoias has to offer, your first instinct is probably to start packing your bags and driving to Yosemite tomorrow! However, this area closed in 2015 for a complete restoration. This restoration project is improving this attraction with more parking, more hiking trails, flush toilets, and much more. If you’re dying to visit this attraction, don’t worry! The Mariposa Grove of Giant Sequoias will reopen in the fall of 2017, so go ahead and mark your calendar to take a trip to Yosemite then to see this incredible natural wonder and all the new improvements. Don’t feel bummed that the Mariposa Grove of Giant Sequoias is closed right now; there’s still an abundance of things to do and see in Yosemite National Park! If you want to see a giant sequoia in Yosemite, you can visit the Merced Grove and Tuolumne Grove. These nearby areas are filled with towering giant sequoias, which are truly a stunning sight to see. You can take guided tours of these areas to learn more about them and their fascinating history. Yosemite National Park is also overflowing with other wonderful things to see, like rivers, waterfalls, and mountain peaks, so be sure to explore as much as you can during your visit! Yosemite National Park is overflowing with breathtaking natural wonders! You will love a trip to this fantastic destination, so be sure to stay in the finest accommodations while you’re here. Hotel Charlotte is a historic bed and breakfast in Groveland, California, located at the gateway of Yosemite National Park. We offer luxurious lodging and outstanding amenities; we can even book you a Yosemite private tour, as we are partners with Yosemite Family Adventures. 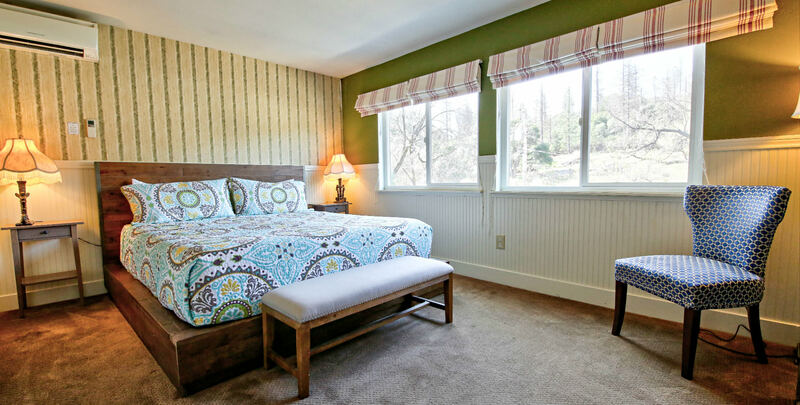 Here at our bed and breakfast, you can choose from staying in one of our twelve lovely rooms or renting one of our cozy apartment rentals, which have the perfect amount of space for families. We also have a beautiful living room, friendly and helpful staff, and even our very own Fork and Love Restaurant to accommodate all of your needs! Don’t wait another minute to start planning your dream vacation; check our availability and book your stay today! Download our free Vacation Guide today! This is your ultimate resource for finding the best things to do in Yosemite National Park!